Warrant Officer Raymond FARIA (who died after being shot down by flak: 25 September, 1944). (and notwithstanding the pettiness of minor bureaucrats). In September 1944, the Allied advance in Italy had finally battered through the heavily fortified “Gothic Line”, which the Germans had erected from coast to coast across the Italian peninsula, pivoting on Florence. Fano, Italy. 26 September 1944. A demolished bridge in the Fano area which gives some idea of the difficult country over which the Eighth Army has been fighting. The Eighth Army's old allies, the Desert Air Force, played a big part in the breaching of the enemy defences in the Gothic Line, which was described as, "an outstanding success and a decisive victory for the Allied arms." Heavy softening-up attacks from the air resulted in only four out of 24 enemy tank turrets being serviceable when our land forces made the breakthrough. All types of aircraft of RAF, South African Air Force, RAAF, and Royal Canadian Air Force took part, including Curtiss P-40 Kittyhawks (Kittybombers), Douglas A-20 Bostons, Glen-Martin Baltimores, North American P-51 Mustangs, and Supermarine Spitfires. (Panther tank) mounted on a concrete emplacement and guarding the road to Rimini. 3 Squadron was part of the enormous Allied airpower effort supporting the attacking forces, but progress was slow, hindered by worsening weather. 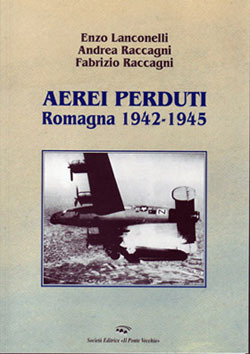 On the 25th of September, 1944, the Kittybombers of No.3 Squadron flew two missions from Iesi landing ground , in the centre of the Italian Peninsula (alternative spelling "Jesi"). The second operation was a dive-bombing attack on the major highway bridge over the Savio River north of Rimini near the Adriatic Sea. As was often the case, the bridge was strongly defended by German flak and one of the attacking Kittyhawks was shot down during the bombing dive. Kittyhawk FX664 spun down in flames and crashed in a field that had been flooded by the Germans as part of their defensive line. The pilot was Warrant Officer Raymond Faria, from Northbridge in Sydney. It was just a four days before his 24th birthday. Warrant Officer Raymond Faria, service number 421045, is buried at Ravenna War Cemetery, Italy. Plot I, Row A, grave 1. Aged 23. Son of Cecil and Mathilde Herminia Faria, of Northbridge, New South Wales, Australia. On 25/9/44, after a formation take-off at 1445, his Curtiss Kittyhawk was hit by flak attacking a bridge over the Savio River. The aircraft spun down in flames. Ray had managed to put his plane down relatively gently, and the shallow water put the fire out, but unfortunately he had received a very serious head wound. Ray remained conscious long enough to inject himself in the leg with morphine, but sadly, he died still strapped in his cockpit. A young local Italian farmer, named Paolo Giambi, saw the crash and tried to reach it across the flooded fields, but he was initially kept away by German troops. Later, Paolo was able to row a boat across to the wreck and give Ray a decent burial on a small island. Paolo’s story is known because of the work of Padre Bob DAVIES. Bob, in his customary fashion, spared no effort in locating the remains of No.3 Squadron’s lost airmen. Bob’s enquiries lead him to Paolo, and Paolo showed him Ray’s grave. Bob wrote a very moving letter to Ray’s mother, Mathilde, explaining Paolo’s kindness. Mathilde and Paolo, linked by this sad event, later corresponded. Mathilde tried to encourage Paolo to migrate to Australia, but he decided to stay in Italy. Many months after receiving Padre Davies’ letter, Ray’s mother noticed that her son’s official status was still “Missing”, and wrote to the RAAF to enquire as to why it wasn’t finalised. It turned out that Padre Davies’ report had been mislaid somewhere up the chain of command. The correspondence file shows that (of course) the desk-bound bureaucrats in Australia chose to blame the poor front-line Padre totally for the problem! After this hiatus, Ray’s body was belatedly located by War Graves personnel and transferred to the Ravenna War Cemetery. The Casualty File for Ray Faria, detailing the twists and turns of the detective story in the years after his death, is online at: https://recordsearch.naa.gov.au/SearchNRetrieve/Interface/ViewImage.aspx?B=1068131 . The file reads best in "reverse order"; type in the number "59" in the "Page" box and hit "Enter" to skip to the last page. However, the caring and thorough documentation created by Bob Davies on was put to use once more in 2006. An Italian aviation archaeologist, Enzo LANCONELLI, used those same pinpoint map-references in Padre Davies's letter to rediscover Ray’s crash site. The modern technology of Internet satellite-mapping allows us to plot the crash location exactly. Since the war the area had been drained and planted. While most of the aluminium wreckage had of course been salvaged long ago, Enzo’s metal detector still buzzed right where Padre Davies had said, and up came a few remaining pieces of twisted metal from Ray's Kittyhawk, still bearing its slate-grey and green camouflage, along with some unexploded 50-calibre ammunition. However, an even bigger surprise awaited Enzo around the corner, where the resident of a small house proved to be... Signor Paolo GIAMBI – the same kind man who had been on the spot in 1944! Paolo showed Enzo photographs that Ray’s mother had sent to Paolo with their correspondence 60 years before. ...And out in Paolo's back shed was, unbelievably, the armour-glass windshield of Ray’s Kittyhawk! Kittyhawk IV Streamlined Armour-Glass Windshield. (in case the reflector-gunsight in the cockpit failed). Click Here for the page mentioning Ray's crash on September 25, 1944. (the website will remain automatically translated as you move from page to page). which will take you to the more detailed story of that particular crash. We hope that this article may attract the attention of modern-day relatives of Ray Faria. (Left) Ray's sister Esme Faria (with her dog "Don"). In 1948 Esme married Arthur Myers in Penrith, NSW. (Right) Ray's mum, Mathilde Faria of Northbridge NSW (previously from South Africa) and Ray's nephew Phillip. Mathilde's letters to Paolo were translated with the help of Mrs Anna Maria Megna Bozzoli of Northbridge. NEWS FLASH: We have now had contact from Esme's daughter Margaret (Ray's niece), who would love to hear from any other long-lost family members. NEWS FLASH #2: Also the magic of the Internet has bought this page to the attention of Phillip (Ray's nephew and Margaret's cousin - the small boy pictured at right!) who now lives in the USA. We were delighted to be able to put him in touch with Margaret.